The obscure Polish composers on this CD are well worth getting to know. Józef Nowakowski (1800-1865) first studied at Wachock Abbey in southern Poland, and began his career playing piano, French horn and trombone. On the other hand, Józef Krogulski (1815-1842) was a wunderkind who made his piano debut at age ten, and then become a renowned virtuoso, who's fame was nipped in the bud at twenty-six, when he died of tuberculosis. Both would attend the Warsaw Conservatory (now The Fryderyk Chopin University of Music), and go on to write some memorable romantic chamber works whose rediscovery is long overdue. That certainly holds for the two selections on this new Fryderyk Chopin Institute release, these being the only representations of them currently available on disc. In that regard, several years ago the Nowakowski appeared on another label (see 31 March 2011), which all too quickly disappeared. Now here it is again in an even better performance. Most of Nowakowski's chamber music was lost for decades. Then in 2003 some of it resurfaced in Berlin, including the second, but alas not the first of his two piano quintets. Originally published in 1833, it’s in four movements, and like Schubert's (1797-1828) Trout Quintet (Op. 114, D667; 1819), calls for piano, violin, viola, cello and a double bass, for which it sounds all the richer. The initial sonata form allegro's [T-1] opening statement (OS) starts with a proud, jaunty introduction (PJ) [00:00] à la Robert Schumann (1810-1856), who met Nowakowski during his concertizing in Europe, and thought very highly of him. It hints at a lyrical flowing theme (LF) that follows immediately 00:44], and is succeeded by a drop-dead songlike melody (DS) [01:50]. The latter is food for some sprightly afterthoughts that end with a brief pause. Then OS is repeated [04:22] and followed by another break. After that some LF-based transitory passages [08:42] bridge into a short development of PJ [09:35]. This is succeeded by an OS-initiated recapitulation [10:59] with some unifying key changes and bravura keyboard work, ending the movement with a romantic glow. The following presto [T-2] is in essence a scherzo that begins with a nervous frenetic theme (NF) [00:00] having a couple of coy moments [01:06 & 02:04]. Then there's a break, and we get an LF-related, love-song-like trio section [02:58-06:24]. This is spiced with hints of NF [03:58 & 05:22], which finally returns [06:24] to conclude the movement much like it began. Next, a winsome romance [T-3] that's a complete change of pace, and opens with the piano playing a delicate dreamy melody (DD) [00:00]. This brings to mind the composer's good friend Fryderyk Chopin (1810-1849), namely the slow movement of his second piano concerto (1829-30), particularly the chamber version. That said, while the pianist dominates the Chopin, all the players in the Nowakowski constantly interact with something interesting to say. Moreover, the strings latch onto DD [00:43], and are joined by the soloist in a mutual exploration of it. Subsequent distraught passages [03:23] then subside into an ethereal episode [04:41], bringing the movement to a sublime conclusion. The work ends in a jolly rondo, which starts with a rustic chugging double bass [00:00]. After that the piano plays a convivial folkish ditty (CF) [00:05] along the lines of the main theme in the last movement of the Schubert mentioned above. Then CF is repeated, toyed with, and the piano intones a lyrical variant of it (CL) [01:52]. CL is picked up by the strings [02:12] and spiced with virtuosic keyboard embellishments, after which CF returns in good rondo fashion [03:14]. Then there's a double-bass-initiated treatment of CF [04:00], and CL reappears [05:01]. It sires a virtuosic coda [06:09] that ends this magnificent quintet emphatically. The scoring for Krogulski's Octet includes the above instrumentation plus flute, clarinet and an additional violin, all of which make for an even more colorful work. Written around 1834 when the composer was only nineteen, there are four movements, the initial one being in sonata form [T-5]. Its opening statement includes a pensive introduction (PI) [00:01], featuring questioning piano passages set to a sighing accompaniment, succeeded by two ideas. The first is a perky scampering tune (PS) [01:44] that could be out of a Mozart (1756-1791) piano concerto (1767-91), and the other a graceful minuet-like number (GM) [02:40]. An excited exploration follows, after which both themes are repeated [03:39], and followed by a short, excited development [05:33]. This leads to a recapitulation of PS [06:14] and GM [07:14], but Józef suddenly pulls the rug out from under us with a forte chord and pregnant pause. Then PI returns [08:06], and the pianist makes a forceful entrance belting out PS [08:49]. This initiates a crazed coda that ends the movement exultantly. The subsequent "Adagio" has rhapsodic outer sections [T-6] based on a lithe seductive theme (LS) [00:01]. They bracket an assertive episode with a strutting piano [02:26-04:05]. Oddly enough, LS like DD in the Nowakowski recalls the same Chopin piece (see above). Then we get a change of pace with a "Menuetto" [T-7] having fidgety outer segments wrapped around a flowing, songful trio [01:40-03:18]. In conclusion Krogulski gives us something called "À la Bohemienne" [T-8] that’s structurally similar to the first movement. Its opening statement begins with a throbbing introductory phrase (TI) [00:00] succeeded by a twitchy nonchalant theme (TN) [00:03]. Then there’s a cheeky tune with an infectious avian pecking rhythm (CA) [00:54]. They’re the subjects of a tempestuous development [01:42], which calls to mind the storm in the fourth movement of Beethoven's (1770-1827) Pastoral Symphony (No. 6, 1808). Then there’s a recapitulation of TN [02:39] and CA [03:28], where Józef again surprises us with another of those forte chords and pregnant pauses. After that TI and TN return, powering a frenetic coda [04:15], which ends the octet with a beaming smile. 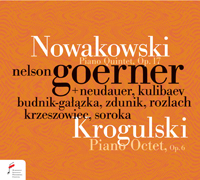 Pianist Nelson Goerner, violinist Lena Neudauer, violist Katarzyna Budnik-Galazka, cellist Marcin Zdunik and double bassist Slawomir Rozlach render a stirring, immaculate account of the quintet. They're joined by flutist Jan Krzeszowiec, clarinetist Radoslaw Soroka and violinist Erzhan Kulibaev for an equally distinguished reading of the octet, which captures all its youthful vigor. The recordings were made on a couple of occasions three years ago at Polish Radio's Witold Lutoslawski Concert Studio, Warsaw. They project wide sonic images for both works in warm, pleasantly reverberant surroundings. The instrumental placement, balance and timbre are generally good with a couple of reservations. Moreover, the piano seems spread across the soundstage, and is occasionally blurred in complex passages. As for the strings, the violins have a bit of an upper edge, and could have benefitted from a little more highlighting. All these quibbles aside, it's not only great to have the quintet back, but paired with another remarkable Polish chamber music discovery. Almost three years ago CPO introduced us to the second of Croatian composer Boris Papandopulo's (1906-1991) three numbered piano concertos (see 8 September 2014. Now they give us the third paired with his only violin concerto. Separated by some fifteen years, they're good representations of his eclectic, changing style. These are the only recordings of them currently available on disc. Like the music of Leos Janácek (1854-1928) being written in the Czech Republic just to the north, Boris's early efforts are folk-influenced, and of late romantic, nationalistic persuasion. The violin concerto dating from 1943 is a good example. Soon after its highly successful 1944 Zagreb premiere, the composer sent it to his Berlin publisher for an upcoming Munich performance. Unfortunately, World War II (1939-45) Allied bombings of Germany prevented this, and the score might well have been destroyed had it not been hidden away in an air-raid shelter. Twenty-five years intervened before Boris got the music back, and conducted a second performance in Rijeka, Croatia (1969), some eighty miles west-southwest of Zagreb. Having the usual three movements, the initial andante lasting almost half an hour is the longest [T-4]. In extended sonata form, it begins with a devout, pensive orchestral introduction [00:01]. It calls to mind more reverent moments in J.S. Bach's (1685-1750) cantatas (1707-46), except for repeated thunderous strokes on the bass drum [00:01]. All this hints at a warlike march number (WM) that will soon appear, and gives way to the soloist, who enters playing anxious WM-related passages [01:12]. These become more laid-back to heavenly harp glissandi, and the tutti reappear with that big drum [03:06], ending this section tranquilly. After a brief pause we get the opening statement, which starts with the orchestra playing a tumultuous full rendition of WM [04:31]. It's picked up by the violin [06:05], elaborated, and is the basis for a fluent bridge [07:30] into a comely pastoral, folk-song-like tune (CP) [07:47]. This is explored, and both ideas are subjected to a highly dramatic, virtuosically demanding development of contrasting moods [09:21]. After that the return of WM on the violin [14:59] announces the recapitulation [14:59]. CP quickly follows [16:28], and then a colossal, killer cadenza [18:54-23:23]. The latter ends with a drum roll, whereupon the orchestra bursts in bringing the movement to a bass-drum-enhanced, seismic conclusion. The andante [T-5] is a rhapsodic fantasy that must rank with the most moving slow movements in Slavic romantic violin literature. It's based on the haunting Croatian folk song "Lepi Jura kres nalaže" ("Handsome George lights the bonfire"), which is rooted in the legend of Saint George and the Dragon. This comes from the Turopolje area of Croatia just south of Zagreb, and is eloquently sung by the violin to an emotional orchestral accompaniment. Then the work ends with a brilliantly scored allegro that's an infectious rondo [T-6], beginning with festive orchestral fanfares [00:00]. These are followed by a scurrying, koloesque folk dance number for soloist and tutti (SK) [00:23]. SK is tossed about with great abandon, giving rise to a series of sprightly, high-stepping episodes. They make it easy to imagine some merry peasant village celebration. Then SK returns, at one point accompanied by more thwacks on that monster drum [04:49]. After that the concerto concludes excitedly with virtuosic flourishes for the soloist, an exultant tutti, and final forte "So there!" chord. Coming sixteen years later, the third piano concerto (1959) is considerably more progressive, and reflects the composer's later style, which shows a variety of diverse influences. These include not only the Russian "Mighty Handful" (see 31 March 2017), but French impressionists as well as "Les Six" (see 9 September 2009). There are also sprinklings of expressionism, twelve-tone technique, neoclassicism, and even snatches of jazz. An initial moderato [T-1] opens with a subdued, ominous, repeated motif for the lower strings (OR) [00:01], and scurrying piano passages [00:08]. Shimmering violins add an air of mystery as the music becomes increasingly agitated with brass flourishes plus whacks on that big drum Boris so loved. A couple of Slavic-sounding ideas follow, which may bring to mind Mily Balakirev's (1837-1910) quirkier tunes (see 28 October 2008). The first is a sprightly ditty (SS) played by the soloist [02:25] and its companion, a dancelike melody (SD) for the tutti [02:39]. These are the subjects for a commanding developmental exploration [03:01], where we get saucy, chromatic twists-and-turns reminiscent of Ravel (1875-1937) and Poulenc (1899-1963). All this is spiced with more arresting bass drum thumps and snatches of jazz as well as dodecaphonic tidbits. Then OR reappears [08:05], empowering a dramatic episode. It has some final, laid-back solo keyboard thoughts [10:38] that end the movement mysteriously. Next, an andante theme with variations [T-2] that gets off to an eerie start (ES) [00:01] with seismic drum thumps, brushed cymbal strokes, and woodblock knocks. Next the soloist introduces a mournful, searching main subject (MS) [00:08], and plays a couple of commentative MS variants with tutti support. About halfway through ES and MS return [04:51 & 04:58], after which we get more variations that range from commanding [05:38] to jazzy [07:01] and pastoral [08:58]. Then ES reappears [09:48], ending the movement full circle. Apparently Papandopulo borrowed the themes for the last one from his three-act comic opera Camping of 1959, which only survives in vocal score (see the informative album notes). Marked allegro [T-3], it’s a brilliantly instrumented, jazzy, 1930-40s, big-band-sounding movement that brings George Gershwin (1898-1937) and Leonard Bernstein (1918-1990) to mind. The musical excitement never lets up right from its syncopated start [00:01]. Here the piano lays a fetching, pert number (FP) [00:12] on us, which it tosses about with the tutti. Then there's one of those anticipatory Benny Goodman (1909-1986) pauses, and all hell breaks loose in a wild developmental cavort [02:22]. Here the percussion, and that bass drum in particular, get a real work out. The concerto concludes with a boogey-woogie piano solo [05:03], featuring a bawdy foxtrot [05:41], followed by the return of FP [06:08]. This is cause for the orchestra to join the fray, bringing the work to a raucous conclusion with a final stroke on you know what! These performances include a group of international artists. Moreover, German pianist Oliver Triendl continues his invaluable exploration of Croatian music (see 8 September 2014) with this superb rendition of the second concerto. His technical abilities complemented by a keen attention to phrasing as well as rhythmic detail, particularly in the work's last movement, make for a thrilling performance of this rarity. Chinese violinist Dan Zhu gives us an equally outstanding account of the earlier work. Both artists receive dedicated support from Finnish conductor Ville Matvejeff and the Croatian musicians of the Rijeka Opera Symphony Orchestra (ROSO), who deliver committed, rousing accounts of their countryman's music. Made last year in the Hrvatsko Narodno Kazalište (HNK, Croatian National Theater), Rijeka, the recordings project a slender, withdrawn soundstage in a pleasant venue. The soloists are suitably captured and balanced, while the overall ROSO instrumental timbre is characterized by agreeable highs, a compact midrange, and seismic lows propagated by that pervasive bass drum. Those with sound systems that go down to rock-bottom are advised to secure all loose doors before playing this disc! Continuing their survey of German-born and trained, Dutch-naturalized Julius Röntgen's (1858-1932) orchestral music (see 23 September 2013), CPO now gives us two more of his twenty-five symphonies, plus a four-part serenade. These are the only recordings of them currently available on disc. The ninth subtitled "Die Bitonale" ("The Bitonal", 1930) [T-1] finds this conventional, romantically oriented composer dipping his toe into avant-garde waters. Moreover, he's exploring bitonality (aka polytonality), or the simultaneous use of more than one key. But his adventurousness ended here without his ever setting foot in the atonal land of the Second Viennese School (1920-30s). In a single movement, the work has a haunting, harp-laced preface (HH) [00:02] and mysterious, wayward opening segment (MW) [00:19] that stray from the conventional tonic-dominant-subdominant scheme of things. Both are repeated [01:35], and explored with frequent references to HH. Then after a brief pause, there’s a tripping, waltzlike episode [04:17] that builds to a frenzied climax worthy of César Franck's (1822-1890) Le Chasseur maudit (1882). This fades giving way to a commanding motif [08:20], which is the ostinato for an ensuing passacaglia having twelve variations. These range from valiant [08:48], pleading [09:19], rustic [09:36], heady [10:01], songlike [10:22] and amorous [10:46], to demanding [11:55], chivalrous [12:25], coy [13:01], pensive [13:24], nostalgic [14:14] and pious [15:13]. Then the return of MW's opening measures [15:33], and an HH afterthought [16:14] end this venturesome Röntgen creation full circle. This symphony was followed by a flurry of compositional activity, and by the fall of 1931 Julius had completed his twenty-first effort in the genre. It’s another single movement work [T-6], but this time a dark offering that’s in essence a theme and variations. The opening main subject is a brooding chromatic idea (BC) for the lower strings [00:02] accompanied by sustained wind notes. After that there are more allusions to BC [01:10 & 01:34] followed by a dramatic exploration of same [02:08], which brings Bruckner's (1824-1896) late symphonies (1881-1896) to mind. Next, a momentary pause and brass flourish [04:34] announce a laid-back variant [04:40] and subsequent scherzoesque one [06:26]. The latter is the symphony's only sanguine spot, and immediately succeeded by the gloomy return of BC [08:08]. It ushers in excited, skittering passages [08:24] that become domineering [09:38], and with a couple of quick breaks along the way, make a subdued transition [10:30] into a wispy variation [11:21]. This ends with a sudden whack on the timpani [13:27], triggering a grandiose BC segment, followed by rushing [13:48], rustic [14:13] and pastoral [15:08] treatments. The last of these gives way to increasingly troubled passages. These erupt into an anguished episode [16:30], which concludes the symphony with compelling reminders of BC that are once again of Brucknerian persuasion. Filling out this latest installment in CPO's Röntgen revival, we journey back some thirty years for his Serenade in E major (1902). In four movements, the composer aptly described it to his good friend Edvard Grieg (1843-1907) as "very lyrical". And in that regard, there's a relaxed pastoral air about it reminiscent of the great Norwegian composer's more halcyon fare. The initial "Moderato" ("Moderately") [T-2] is a delightful piece built around a charming, radiant tune (CR) [00:01]. Here, it’s easy to imagine a spectacular sunrise at the peaceful mountain retreat in Semmering, Austria, where Julius wrote this work. He frequently borrowed from folk melodies, and CR may well be a case in point. Then we get an "Allegretto con grazia" ("Gracefully Fast") [T-3], which is scherzo-like. It starts with capricious passages [00:01] smacking of Mendelssohn's (1809-1847) puckish moments, and invokes what could be morning breezes as well as bird songs. They alternate with another folklike ditty [01:08 & 03:08] that could limn verdant mountain valleys. Next, there's "Un poco andante" ("At a Slow Walking Pace") [T-4]. Based on an ambulatory idea [00:01] that saunters around thematically related bucolic passages [01:19-03:03], this would seem to be a serene hike through the countryside. The concluding "Allegro molto" ("Fast and Lively") [T-5] might represent a festive village celebration, where its two ideas conjure images of dancing peasants [00:01] and amorous couples [01:07 & 03:41]. Then the return of CR [04:41] ends this fetching musical portrayal of a day in the country with what could be a beautiful sunset. Conductor David Porcelijn continues his invaluable survey of Röntgen’s symphonic works (see CPO-777310, and 23 September 2013), this time with the Frankfurt Brandenburg State Orchestra. Once again, he gives what will undoubtedly be definitive accounts of these three selections for some time to come. While the Serenade pretty much plays itself, the two symphonies are highly integrated, structurally complex works, and Maestro Porcelijn's careful attention to phrasing, dynamics and rhythmic detail bring out all of their subtleties. These recordings were done back in 2005 at the Kleist City, "Carl Philipp Emanuel Bach" Concert Hall, Frankfurt, Germany. They project a generous soundstage in a warm reverberant space that was once a 13th century Franciscan monastery. The surroundings add just the right amount of reverberation to enrich this romantic music without blurring the sonic image. Röntgen's carefully scored works are beautifully captured with lifelike highs, a convincing midrange, and profound, clean bass. This demonstration quality CD will appeal to audiophiles, particularly those liking wetter sonics. Barshai was well qualified to do this as he'd played viola with the Borodin Quartet from 1945 until 1953, and in 1955 became the founding conductor of the world-renowned Moscow Chamber Orchestra (MCO). He'd hold that post for almost twenty years, during which he’d develop a close association and friendship with Shostakovich. Then Russian anti-Semitism reputedly forced him to abandon his MCO post in 1977, and emigrate west, where he took other conducting assignments. Backing up a bit, around 1960 he worked Prokofiev's (1891-1953) biting piano pieces known collectively as Visions fugitives (Fleeting Visions, 1915-7) into a highly acclaimed chamber transcription. Spurred on by the popularity of this arrangement, Rudolf then got Dmitri's permission to orchestrate his eighth string quartet (Op. 110, 1960). This was such a great success, the composer wrote him, suggesting he should consider doing more of them. Consequently, he came up with another four “Chamber Symphonies” that along with the first are consummate, virtuosically demanding arrangements. All five have a textural variety and increased dynamic range, which give them even greater emotional impact than the parent quartets, but without leaving Dmitri's sound world. Three of them, namely the first, fourth and fifth, are on the Naxos CD pictured to the right [DR]. This disc came out over a year ago, and has already received glowing reports from several readily available sources. Accordingly, we'll keep our comments to a minimum. Appropriately enough Barshai's initial effort (1960 for strings after Quartet No. 8, Op. 110, 1960) starts with a largo [DR, T-5] and the notes D-Eb-C-B [00:00], or "D-S-C-H" in German notation, which is a musical monogram (MM) Shostakovich frequently used (see 30 September 2012). MM reappears throughout the piece, and there are also many other thematic teasers from works of his predating the parent quartet. For a more detailed listing of them click here. Returning to the largo [DR, T-5], it's the first of five conjoined movements, and takes the form of a despondent lament. This is offset by an infectious, antic allegro [DR, T-6], which has those combative driving motifs that are one of Shostakovich's most distinguishing stylistic traits. These include MM (beginning at 00:30], a whinnying version of which [DR, T-7, 00:00] foals a sardonic allegretto followed by two concluding largos. The first of the latter begins with a forte three-note riff (FT) [DR, T-8, 00:00] that's repeated, and soon followed by a despondent, FT-riddled passage [00:51]. The music becomes increasingly wistful, and then the return of FT [04:43] and MM [04:48] initiate the final largo [DR, T-9, 00:02]. This is an MM-riddled elegy that ends the work with a feeling of hopeless resignation. Dmitri must have really been bummed out when he wrote the parent quartet! Five years later Barshai came up with a second "Chamber Symphony" (1965 aka "Symphony for Strings" after Quartet No. 10, Op. 118, 1964), and it would be another twenty-five before he completed a third. These two fill the recently released Naxos disc pictured to the left [DL]. The earlier one is only in four movements with an opening andante [DL, T-6] that's a giddy piece of work consisting of tiny, mercurial motivic tidbits. These are underlined by fragmented questioning ideas [00:15], which at one point make a spooky sul ponticello appearance [03:41]. This pixilated music is completely offset by the following allegretto furioso [DL, T-7] that’s a bellicose foray. Then peace is restored in the next adagio [DL, T-8], which is a somber passacaglia. This has sad lower strings intoning a lugubrious ostinato (LR) [00:00], over which the upper ones play descants of consolation. But to no avail as the movement ends with weeping passages for the would-be comforters. These bridge directly into the finale [DL, T-9] that starts with a cheery cantering ditty (CC) [00:00]. This is explored, and followed by a CC-related, flowing, folk-song-like (CF) melody [01:18]. The two ideas are then intertwined with arresting pizzicato accents [02:23], and come to an agitated climax. It falls away into the return of LR [07:03], bringing back memories of the previous adagio. Then we get a short pause, and LR-derived solo passages [07:41] introduce a delicate concluding section, starting with the reappearance of CF [08:06] and CC [08:36]. There are also hints of ideas from the first movement [beginning at 09:50], thereby ending the work in the same spirit it began. Moving ahead fifteen years we get the other selection on this disc, Barshai's third "Chamber Symphony" (1990 for woodwinds, harp, celeste & strings after Quartet No. 10, Op. 118, 1964). In five movements, the opening allegretto [DL, T-1] begins with an impish tripping tune for strings and harp (IT) [01:01]. It's followed by flute and oboe intoning a subdued, taunting countersubject (ST) [01:17]. Then IT initiates a capricious, development with contrapuntal layering [02:22], after which ST [04:38] announces a curt recap. This sparks a frenetic IT-based coda [05:12] that ends this sonata form cavort with a sneeze! The succeeding moderato [DL, T-2] is a troubled intermezzo where a sawing bass line [00:00] underscores a flighty headstrong theme [00:02]. It alternates with a dismissive countersubject (DC) [02:09], and then a plangent woodwind reminder of DC [04:49] closes the movement despairingly. Hostilities break out in the allegro molto [DL, T-3], which is a pugnacious scherzo that brings to mind Dmitri's war symphonies (Nos. 4-9, 1935-1945). Here rhythmically martial themes conjure up thoughts of goose-stepping Nazis, and humongous Stalin tanks on the move. The next adagio [DL, T-4] is another passacaglia (see above), and opens with an ominous ostinato (OO) that’s an ascending-descending motif for the strings [00:00] linked to a plangent oboe retort [00:20]. Then OO is repeated [00:54], but with a clarinet rejoinder, after which OO appears four more times to varying accompaniments. These range from apathetic [01:58] to grief-stricken [02:46 & 03:53], and finally resigned [04:30]. This movement bridges directly into the final moderato [DL, T-5] that lasts about twice as long as any of the preceding ones. It opens with cellos and harp intoning an ambling, singsong theme (AS) [00:00], which is picked up by the winds [00:45]. AS is succeeded by a related longing melody (AL) played by the upper strings [01:40] that's set to a pizzicato accompaniment. After that AS reappears [02:40] followed by a jolly, rustic bassoon tune (JR) [03:26], and JR is explored leading to the return of AS [05:01] and AL [06:12]. They fuel a highly agitated episode with a commanding reminder of OO [06:12] (see above) that falls away into a plaintive cello passage [06:53]. This is immediately followed by the return of JR in the high strings [07:26], which sashays about. It then slows into a tranquil reminder of AS [09:16] with some gentle harp strokes, concluding the work on a celestial note. The earlier CD on the right is filled out with the last two "Chamber Symphonies", both of which are four-movement works. The penultimate fourth (1990 is for chamber orchestra after Quartet No. 4, Op. 83, 1949), and the most colorfully scored of all five. Its opening allegretto [DR, T-10] begins with a reflective thematic nexus (RT) played by the upper instruments [00:00] over a drone accompaniment from the lower ones. RT is subjected to a rhapsodic development having a brief dialogue for the winds [02:18-03:17], and then ends the movement peacefully in a nostalgic reminder of RT [04:01]. An andantino [DR, T-11] follows, beginning with subdued, sighing strings [00:00] succeeded by a keening woodwind idea (KW) [00:05]. This undergoes a couple of variational explorations that are respectively tormented [01:38] and hopeful [03:31]. Then bits of KW return [04:32, 04:49 & 05:13] to end the movement with a hint of optimism. Next there's an allegro [DR, T-12] that's an aloof scherzo. It opens whimsically, and has a Slavic folkish theme [00:51], which turns into a twirling episode [02:29]. The latter bridges via a sustained wind note into the final allegretto [DR, T-13]. It starts with a relaxed nonchalant theme (RN) [00:03], and a brief fanfare [00:42] heralding a mischievous, agitated idea (MA) [00:47]. The two undergo a colorful dramatic development [01:51], after which forceful reminders of RN [05:22] and MA [05:31] begin a cheeky recapitulation with petulant whip snaps [06:28]. This winds down, and after a brief pause there’s an RN-reminiscent, laid-back coda [07:20] that ends the work in hushed anonymity. The fifth and final "Chamber Symphony" (1995 for celeste & strings after Quartet No. 1, Op. 49, 1938) starts with a moderato [DR, T-1], having a sighing first theme [00:02] followed by a dramatic pleading idea (DP) [01:24] set to a jocular, hiccupping accompaniment. The two undergo a cursory, searching development [02:34], after which a DF-related, recap coda [04:09] ends the movement uneventfully. It’s followed by another moderato [DR, T-2] that’s a theme and variations that starts with a dreamy, lullaby-like main subject (DL) [00:00]. The succeeding transformations include a winsome, celeste-gilded one [02:14], and then the movement ends in a pizzicato-decorated DL [03:30] with a categorical final pluck. The next allegro molto [DR, T-3] is a scherzo with airy outer sections. They surround a dainty, dancelike trio tune [00:49-01:49] that takes a brief bow towards the end [02:05]. In closing, we get an allegro [DR, T-4], which begins with an angular skipping idea [00:00] complemented by a folkish sounding one [00:43]. They’re tossed about, and the work ends energetically bringing Rudolf's series of "Chamber Symphonies" to a rousing conclusion. The Ukrainian National Chamber Ensemble known as the "Kiev Virtuosi" under their principal conductor, Dmitry Yablonsky, play this music to perfection. It's obvious from the many solos that these musicians are all virtuosos in their own right. That plus Naxos bargain prices, make these two discs the obvious choice for those wishing to acquire all five works. The recordings were made in the National Radio of Ukraine Concert Hall, Kiev. Despite their being done on three separate occasions between 2014 and 2016, the sound is consistently good with maybe a hint of digital grain in the fourth "Chamber Symphony". They project an ideally sized sonic image in enrichingly reverberant surroundings with all the instruments well placed and balanced. The overall timbre is lifelike with bright, pleasant highs, except as noted above, a musical midrange, and clean bass with no low string hangover. Twentieth century Russian music enthusiasts as well as any audiophiles among them won't want to be without these CDs. Born in Braunschweig, Germany, Hans Sommer (1837-1922) began his career as a noted mathematician and teacher at his hometown university. But he'd always had a keen interest in music, and spent many years taking privately financed composition lessons that culminated in studies with Franz Liszt (1811-1886) during 1884. Shortly thereafter he moved to Berlin, where he became a freelance composer and music journalist. Best remembered for his lieder, which portend that of the Hugo Wolf (1860-1903), and ten operas, he also wrote a few chamber works. They're sampled here, these being the only recordings of them currently available on disc. The program begins with his sole piano quartet, which was probably written around 1870 for one of the musical soirées Sommer is known to have organized at his parents' home. The version presented here is a revision he did around 1884 (see the album notes). In three movements, the first marked "Langsam, in gedrückter Stimmung -- Ziemlich rasch, entschlossen" ("Slow and Reserved -- Fast and Resolute") [T-1] is in classic sonata form, and starts with a retiring introduction [00:01]. This hints at a rising-falling, headstrong theme (RH) that quickly follows [01:18], bringing to mind his longtime friend Richard Strauss’ (1864-1949) chamber works written in the late 1800s. RH undergoes a scurrying examination that bridges into a related, singing idea (RS) [02:20]. Then after a pause we get a tuneful RH-invoked development [03:19] that leads to an RH-initiated recapitulation [05:51], where RS soon reappears [07:02]. It's succeeded by an agitated piano-introduced coda [07:46], which trails off, ending the movement uneventfully. The middle "Nicht zu langsam, getragen" ("Not too Slow, Stately") [T-2] is the longest, and another of those theme and variations with a sonata form superstructure (see 31 March 2017. The opening statement begins with the piano playing a serene, somber theme [00:00]. This is followed by four variant countersubjects that are respectively inquiring (VI) [00:51], amorously rhapsodic [01:16], affectionately caressing [02:11], and furtively waltz-like [02:58]. After that we get a questioning development [04:21], and the entire opening statement is recapped [06:19]. Then there’s a brief SS-based nostalgic afterthought [10:36], which ends the movement composedly. The quartet closes in rondo fashion with "Leidenschaftlich bewegt" ("Passionate and Moving") [T-3]. This starts with a catchy thematic nexus (CT) having three components that are sequentially rollicking [00:00], playful (CP) [00:28], and coy (CC) [00:56]. A developmental version of CT [01:35] with rhapsodic variants of CP and CC comes next. Then CT returns [05:17], and lo and behold, VI (see above) makes a cameo appearance [07:02]! It's succeeded by an agitated CP-VI-based coda [08:00] that ends the quartet perfunctorily. 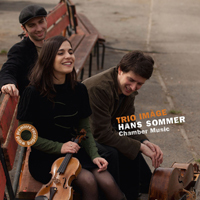 Next up, Sommer's only piano trio, which is in four movements, and was probably written around 1884. The initial sonata form one [T-4] in keeping with its marking "Bewegt" ("Movingly"), begins with a strumming piano riff (SP) [00:00], and the cello intoning a heartfelt first subject (H1) [00:11]. This undergoes a brief exploration, and is followed by a yearning second (Y2) [01:37]. Then SP prefaces a tender development of both ideas [02:57], and reappears [06:11] along with H1 [06:21] and Y2 [07:42], announcing a moving recapitulation. This concludes with an animated coda [08:40] that ends the movement excitedly. Marked "Lebhaft" ("Lively"), the next is a scherzo [T-5], featuring a merry little ditty [00:00]. It dances around a gentle related tune [01:40], and ends the movement without a care in the world. On the other hand, the moving "Adagio" [T-6] is contemplative with a pensive theme that brings the opening of Suppe's (1819-1895) Poet and Peasant (1846, see 25 February 2013 to mind. It's a respite before the antsy "Allegro molto" [T-7], which is a rondo with three recurring ideas. Respectively flighty [00:01], childlike [00:33] and songful (S3) [00:49], they surround a serious, big tune version of S3 [02:07], and end the trio exultantly. Our concert closes with three short incidental works for violin and piano. The initial one is titled "Gavotte" [T-8], and dates from around 1912. It’s a dainty, charming morsel that's an ideal encore piece. Then we get "Romanze" in its original unpublished version of 1908 [T-9]. Marked "Sehr langsam" ("Very Slowly"), this is a lithe, chromatic offering that smacks of Hans Pfitzner's (1869-1949) more introspective moments. Finally, from 1921 there's Entschwundenes Glück (Vanished Joy) [T-10], which surfaced a few months before Sommer's demise. There's a wistful abandon and resignation about this piece that imply the composer had made his peace with the world, and was ready to move on. Our performers are the highly acclaimed, award-winning Trio Imàge, who are joined by violist Harmut Rohde for the quartet. Their playing is uniformly superb, and characterized by technical precision and attention to detail. They turn some music that in lesser hands might be ordinary fare, into a memorable listening experience. Made almost three years ago in the Jesus-Christus-Kirche, Berlin, which is one of the world's finest venues, these recordings present a modest, withdrawn sonic image in richly reverberant surroundings. The musicians would have sounded even better had the microphone setup and postproduction mixing imparted a greater sense of space around them. While the instruments are effectively captured, their overall timbre is not ideal. Moreover, it's characterized by rounded highs and a somewhat confined midrange. However, with repertoire this rare, musical considerations greatly outweigh audiophile ones.